Whether you've just started blogging or have begun writing a full book, you know you've forgotten some of the homonyms you learned in fourth grade! And how long has it been since you addressed wordy constructions? How about the difference between unbreakable grammar rules and style choices? The Great Little Last-Minute Editing Tips booklet to the rescue! This little booklet is not designed to tell you everything! I mean, who wants to read a dictionary, page by page! But the Great Little Last-Minute Editing Tips for Writers is a fun start, written with some humor, to get you started thinking about (and remembering!) the most important things that will keep you from making embarrassing errors in your writing. "A useful, ready reference for those odd blank moments when the 'right' spelling for one of the English Language's many 'tease' words just won't come!" 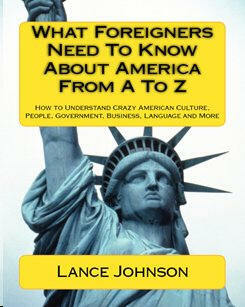 This book available in paperback and as an e-book. Great little companion booklet to the wordtrippers booklet. Is there a difference between “childlike” and “childish”? Actually, there is. 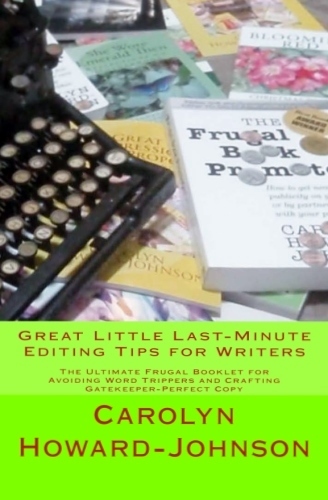 That's just one of the things I learned when reading Great Little Last Minute Editing Tips by Carolyn Howard-Johnson, which is a companion volume to her other book, The Frugal Editor: Put Your Best Book Forward to Avoid Humiliation and Ensure Success. Reading this book reminded me of the first book in my Revisions series, which is scheduled for publication this spring (and notice that it is “spring” and not “Spring”). In the editing section of that book, I show the difference between popularly confusing words, such as lay/lie, this/that, who/whom and farther/further. In the first part of this book, “Trip-You-Up Words,” Carolyn explores word pairings (or even triplings) of words commonly confused with each other. I'm glad she included information on the difference between "anxious" and "eager.” I trained myself to stop using "anxious" in a positive way (such as, "I am anxious to see you again") by remembering that the "anx-" prefix is similar to "anxiety." Thus, "anxious" is similar to being filled with anxiety. So would I be feeling anxiety at the prospect of seeing a friend again? Not if it's a good friend! So the correct word is "eager." This made me laugh: "The sidekick baseball announcers are big on commentary. My gawd! Those statistics and opinions! They go on ad infinitum." (Page 20) One thing Carolyn is known for is her wit and sense of humor. It was pleasant to see this side of her shown in her book. I wish she had included the difference between compliment/complement. On the other hand, readers must remember that this itty bitty book is only a “companion” volume to her larger, in-depth book on editing. You’ll also find more editing tips on her blog, “The Frugal, Smart and Tuned-In Editor." If a word pairing is not covered here or in her book, chances are good she has taken it on in her blog. She doesn't exactly explain why there is a difference between "hope" and "hopefully," and why using "hopefully" in the common way it is misused is incorrect. (I was surprised to learn this, myself.) Again, however, check with her book, or her blog. Some readers of this book, and many others like it, may reach the conclusion that Carolyn must always have perfect grammar and never make a mistake. Unfortunately, this is a widespread opinion of such authors and writers. Even some may believe such a thing of Mignon Fogarty ("Grammar Girl"). However, these writers are only human, and humans are prone to make mistakes. Even grammarians make mistakes. Editors make mistakes all the time. Carolyn reminds her readers of this by sharing an embarrassing goof in using the wrong word in the title of a poem she shared with her class, concluding with: "This experience gives me a chance to remind you to be forgiving of others when they error; your turn is sure to come." I was grateful to learn the difference between "podium" and "lectern." I know I have misused "podium" a time or two. Now, thanks to this "great little" book, I'll be sure to remember which word is the correct one to use! I love how she points out the popular mispronunciation of words, some of which even I am guilty of. It is not "mischievious," but "mischievous." It is not "verbage" but "verbiage." Likewise, she points out the popular way sayings are repeated incorrectly. It is not "could care less" but "couldn't care less." It is not "tie you over" but "tide you over." In one of my manuscripts, a character is guilty of often quoting popular phrases incorrectly, and we’ve all gotten a chuckle or two when someone does this in a TV show or movie. Still, it's nice to know the correct way to say such a thing for what you really mean. This “great little book” of editing tips gives readers a down-to-earth and refreshing approach to better grammar and usage. Grammarians bemoan the incorrect wording of the sign “ten items or less” and chuckle over a sign advertising “tattoo’s.” (Whose tattoo, exactly?) While we are imperfect writers living in an imperfect world filled with grammar mistakes and mispronunciations, it’s editing books like this that helps us get one step closer to writing, and speaking, clearly and succinctly. ~Reviewer Dawn Colclasure is an author of Totally Scared: The Complete Book On Haunted Houses where she shares everything you ever wanted to know about haunted houses, and the ghosts who haunt them! She is a contributing writer for SIGNews. Tweet with her at www.twitter.com/dawncolclasure. This booklet is an addendum to a list in the appendix of my book, The Frugal Editor: Put Your Best Book Forward to Avoid Humiliation and Ensure Success. Even a booklet like this will not complete the list of word trippers, for the English language is so complex we could fill volumes with similar nemeses to writers and editors alike. I hope to have many more quick studies for you. This is addendum number one, as it were. 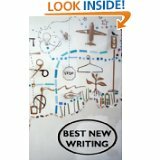 I chose entries in the list in The Frugal Editor from the most frequent mistakes I saw as I edited manuscripts for others. This list fills in where that list left off, but I stick to my original intent of giving writers as many tips as I can in easily absorbed increments, tips that will advance their editing craft. And that craft is as essential to writers as their writing skills—even when they are fortunate enough to be assigned a talented editor or flush enough to hire the best for themselves. Great Little Last-Minute Editing Tips for Writers is full of words that are trouble causers. They either sound alike or are spelled similarly. They are not arcane words that you will seldom have an occasion to use. They are not words the writer knows but still mistypes. Words like to/too/two and their/there/they’re. We've known about those guys and their kin since third grade. Misusing them is a case of your brain and fingers going a bit haywire as you write. Certainly their misuse has nothing to do with your knowing their sneaky ways, and there's no help for their confusion other than, as The Frugal Editor suggests, hiring a second pair of eyes or reading copy backwards. Even effective computer tools like Microsoft Word's Spell Checker won't help. These are little things you just gotta know. It is my hope that—because the paper version of this booklet is slim—writers might take it with them to read and refresh when they are on the go. Or that they will print it out from the e-version and do the same. (Kindle users don't need this advice—they've got this portability thing wired!) I also wanted to keep it short so they won't be daunted by too much to learn. I mean, who wants to tackle the AP stylebook in one sitting! The English language is groping toward a million words. Compared to many other languages, that is a huge number. I won't tell you how many French has, as an example, because it's a touchy subject and experts disagree anyway. French word watchers discourage diluting (polluting?) their language with foreign words so the heft of their dictionary is noticeably light. In addition, language evolves. Those of us who went to school back in the dark ages must adapt. Younger readers may wonder what all the fuss is about, but even you young ones will have to adjust to future changes. The computerized world is moving along at a faster clip than ever before and contributing to changes at the same rate. The point is that it is no wonder those who write in English—those who love words, have studied words, or have a natural facility for words—will always have more to learn. I hope we mere mortal writers will learn enough about editing that we'll pick up on errors our editors overlook. I've actually seen editors overlook the childlike/childish entry in this booklet. Before I sign off, I want to make it clear that I believe one’s voice should come through in all kinds of writing, including texts. The reader should get a sense of who the author is, even in books on grammar. That means I get to talk to you as if we were chatting at Starbucks. And I’m cautioning you, you don’t want an editor to clean up language that makes the personal you come through. For a longer discussion on what to expect from an editor, please refer to The Frugal Editor. After the word trippers I include a list of books for further study. I hope you'll read more than one. Okay, let's get started on this list of trip-you-up words. Yep, that's it. I know, you'll be sorry when you turn the last page! Authors are often surprised to find that they are also retailers: They are selling a product. They're also often surprised that some of their most fruitful partners for book sales are retailers. My series of books for retailers will help them understand retail marketing better. Like Great Little Last-Minute Editing Editing Tips for Writers, Carolyn's Great First Impression Book Proposal is also only $6.95 and takes less than an hour to read.